Sound Greater "ease and focus" -- "the Silent Running isoBASEs helped my Lamm electronics maximize their performance in these areas and in the process sound even more lifelike." Features "Built specifically for the component that will rest atop of it, taking into consideration both the distribution of the component's weight as well as the resonance characteristics of its chassis"; "work not only as resonance sinks but also isolation platforms." Use "Given that the VR 3.0 isoBASEs fit the dimensions of my components perfectly, I have only good things to say about the way they look, which is smashing. " Value They justify their cost with good looks and improved sound. For many of us audiophiles, the racks and bases on which our audio components sit were chosen for functional and stylistic reasons, but we also acknowledge that equipment platforms can affect performance. The right base will improve the sound of a turntable especially, but the performance of tube electronics and CD players is not beyond such enhancement either. Over the years I've used various products from Bright Star Audio and have been very pleased with them. In fact, the single oldest item that's part of my reference system is a sand-filled Bright Star Big Rock base, which I've owned for over ten years and have used with a number of CD players and transports. It improved the sound in every case. So it was with more than a little curiosity that I began my evaluation of Silent Running Audio's VR 3.0 isoBASEs, which claim to make up "the world's only custom-built isolation and resonance control system." Taking its name from submarine terminology, Silent Running is the creation of Kevin Tellekamp, an audiophile with a professional background in acoustics, sound abatement, chemistry, and electronics. In addition to creating equipment bases, Tellekamp produces equipment racks as well as the funky-looking isoDOME footers and isoCRADLE cable elevators. He has also partnered with various audio companies to help them solve their resonance-control issues in addition to offering full machine-shop, painting and silk-screen services on an OEM basis. And if you need a custom-made base or rack, he makes those too. Just be sure you have a few minutes while you're on the phone placing an order because Kevin takes his work seriously and will have many questions for you. Just have a look at the "Request for Quote" area on the Silent Running website for an idea of what I'm talking about. Each VR-series isoBASE is built specifically for the component that will rest atop of it, taking into consideration both the distribution of the component's weight as well as the resonance characteristics of its chassis. A VR isoBASE begins as pieces of high-pressure proprietary laminate with thicknesses to 3/4". These are fashioned into slabs that are either 2" or 3" in total thickness, not including the separate 1"-thick "pre-base" isolation platform that rests beneath certain isoBASE models that will be used on carpet. The thickness determines the platform's model designation, 3.0 for 3" platforms and 2.0 for 2". Spike footers are made of HY-80 high-tensile steel, and steel cups into which the spikes fit are provided as part of the system. What's inside each isoBASE? Put your thinking cap on! Above and around each spike is a hybrid blocked (meaning that its reaction has been chemically stopped) thermal reactive copolymer: a substance that can change its darometer (hardness and softness) in a pre-calculated fashion, and very quickly. The spikes are rather like shock absorbers whose range of motion is governed by the copolymer -- and ultimately Kevin Tellekamp, which is why he asks so many questions about the equipment to be used with his bases. All air must be evacuated from the isoBASE housing before assembly; this is accomplished via a nitrogen-filled "assembly tent." Each VR isoBASE is said to effectively isolate down to 9Hz. Thus VR-series isoBASEs work not only as resonance sinks but also isolation platforms. The isoBASE's gray marbleized outer coating is a catalyzed blend of rubber and cyclonically exploded glass used to help limit static electricity, EMI, and RFI. I found the coating attractive, and given that the VR 3.0 isoBASEs fit the dimensions of my components perfectly, I have only good things to say about the way they look, which is smashing. VR-series prices start at $300 USD and go up to $785, with the VR 3.0 models I received for review coming in at $575 and $485 for the Lamm ML2 amp and L2 preamp bases respectively. As part of the L2 makeover, Kevin also sent along a pair of thick chassis-damping appliques for the inside covers of the control unit and power supply. These cost $25 each and are normally used with the isoDOMEs, where they are said to work far better than mass loading. I used the bases separately before applying the appliques; I wanted to know the effects of each on my audio system. ...and beneath a Lamm L2 preamp. Setting up the VR 3.0 isoBASEs for my Lamm electronics was easy. The amp isoBASEs came in two pieces: One simply fit into the other, and then both were placed on the floor of my listening room, the spike feet piercing the carpet and pad with ease. The isoBASEs for my Lamm L2 preamp are single-piece affairs and separately made for the control unit and power supply -- to account for the different weights and resonance issues. On the bottom of each are more spikes that fit into included cups as part of the setup. Once the bases are in place, with their SRA logos facing forward, I placed my electronics on top. My reference system consisted of the aforementioned Lamm ML2 mono amps and L2 preamp, Wilson Audio WATT/Puppy 7 speakers, Wilson Audio WATCH Dog subwoofer, Mark Levinson No.39 used as a CD player and transport, and a Bel Canto DAC2 digital-to-analog processor. 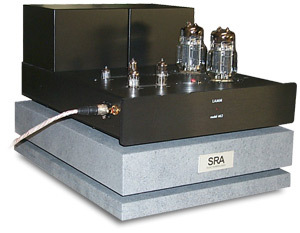 Interconnects and speaker cables were from Analysis Plus (Solo Crystal Oval and Solo Crystal Oval 8), Shunyata Research (Aries and Lyra), or Stereovox (SEI-600 and LSP-600). Power conditioning was provided by a Shunyata Research Hydra or a Sound Application XE-12S with 20-amp Elrod Power Systems power cord. All other power cords were from Shunyata Research: Taipan, Anaconda Vx, and Python. The VR 3.0 isoBASEs for my Lamm amps sat on the floor between the speakers, while the L2 preamp isoBASEs rested on the top shelves of a pair of Target T-4 racks. My basement listening room is 12' x 24' with carpet and pad on top of a cement slab. While the VR 3.0 isoBASEs looked very polished, potential buyers will want them to do more than look good, and in this regard, they don't disappoint. Their contributions to the sound of my system fell into two categories: ease and focus. While my reference system doesn't lack either of these things, the Silent Running isoBASEs helped my Lamm electronics maximize their performance in these areas and in the process sound even more lifelike -- a nice enhancement to be sure. Ease is not simply the sense that an audio system is easier on the ears. It's an indication of how closely a collection of equipment comes to the overall effect of live music, which, when properly produced, doesn't display nasty artifacts of the reproduction chain. Dave Moore's countrified folk on Breaking Down to 3 [Red House Records RHR CD 132] punched out from my Wilson Audio speakers with ultimate naturalness -- no hash, grain or grit -- and rhythmic pace. "Mr. Music" begged to be turned up, so I did. You think SET amps can't go loud? Not so the Lamm ML2s, although the 92.5dB-sensitive Wilson WATT/Puppy 7 speakers had a hand in it. With the Silent Running platforms under my electronics, I could turn things up as loud as my amps would play, a real treat. Image outlines were more distinctly drawn, more crisp and lifelike. Jacques Loussier's series of recordings on Telarc are notable for their plush sound, but the Silent Running isoBASEs tightened them up a bit -- increased focus. The bass on the most recent recording, Handel: Water Music & Fireworks [Telarc CD-83544], is potent -- subwoofer territory. The Lamm amps do a fine job down low, and even more so when sitting on the VR 3.0 isoBASEs. The effect is rather like giving a screw another half turn when it needs it -- imparting in the case of my audio system greater low-end stability and detail. What all of this leads to is more realistic sound, which heightens involvement and makes for longer listening sessions. During a good part of the review, I was putting together a demonstration CD-R for the upcoming CES, and this required picking useful tracks from a number of CDs. Thus I was listening to a lot of music, but instead of playing only the tracks from the CDs I had singled out, I was sampling entire discs or listening to them from beginning to end. In some cases, I even chose different tracks because they were more instructive than the ones I had initially picked. One of these was "Biloxi" from the Mobile Fidelity remaster of Ted Hawkins' The Next Hundred Years [Mobile Fidelity UDCD 702]. I used to own the standard-issue CD of this wonderful collection, but the MoFi remaster is much more open and detailed. "Biloxi" begins with a countdown that will have you thinking that some power chord is about to come. But instead there's soft strumming and some full bass lines followed by Hawkins' communicative voice. I remember thinking as I sat and listened, taking into account nothing about my audio system, that I was incredibly lucky to be there late at night enjoying such a private concert. Of course, I can't lay all of this at the feet of the Silent Running isoBASEs -- my electronics and speakers were involved too -- but their contribution was audible and important. What's also important is keeping things in perspective. So often I read reviews of equipment stands and racks that would have me think such products are in the signal path and bringing forth the sound themselves. I've talked about the VR 3.0 isoBASEs' contribution to the sound I heard, but I don't want to imply that what they do contributes more than the electronics themselves or that they can cure bad sound. Instead, the isoBASES helped my electronics sound more like themselves, maximizing their potential, not transforming their performance. And I don't think I can give these Silent Running products higher praise than this while remaining grounded in reality. I've noted the sorts things I mention in this review about my reference Bright Star Audio products, some of which I reviewed long ago, but the Silent Running isoBASEs make such attributes even more apparent. I keep coming back to the more lifelike quality of the music -- the product of greater ease and focus, which may well be due to my electronics operating at peak performance. 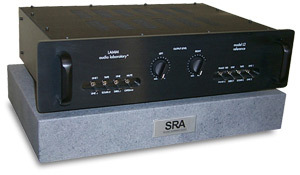 Once I switched back to the Bright Star Big Rock bases I use under my amps, for instance, the sound was not bad by any measure, but it was not the same as with the Silent Running isoBASEs -- less engaging, more bland. I can certainly live with my audio system sounding this way -- I have for years -- but once I hear something that's better, even by a little bit, as is the case here, it's hard to go back. I now wonder what a VR 3.0 isoBASE could do under my CD player. While we audiophiles often want our equipment racks to look every bit as impressive as the components they support, we also know that high-quality audio equipment can benefit sonically from products that help control resonance and micro vibration. On both counts, the Silent Running VR 3.0 isoBASEs that I used with my Lamm electronics were a success. Greater ease and focus were obvious enhancements, but ultimately my Lamm equipment seemed to sound more like it was supposed to, and this is no small consideration given its high price. That the Silent Running products are tailored to the equipment under which they'll sit and look very good doing so are just icing on the cake. If you have a reference-level audio system, you should seek out these reference-level support products from Silent Running. They justify their cost with good looks and improved sound. Prices: $300-$785 USD depending on size and complexity.